Minister for Agriculture, Food & the Marine, Michael Creed T.D., recently announced Irelands Clean Oceans Initiative and called for the participation of the entire Irish trawl fishing fleet in the scheme by 31st December 2019. His ambition is to have all Irish trawlers at every pier and every port actively participating in Ireland’s first co-ordinated initiative on land and at sea to collect, reduce and reuse marine litter and clean up our marine environment. 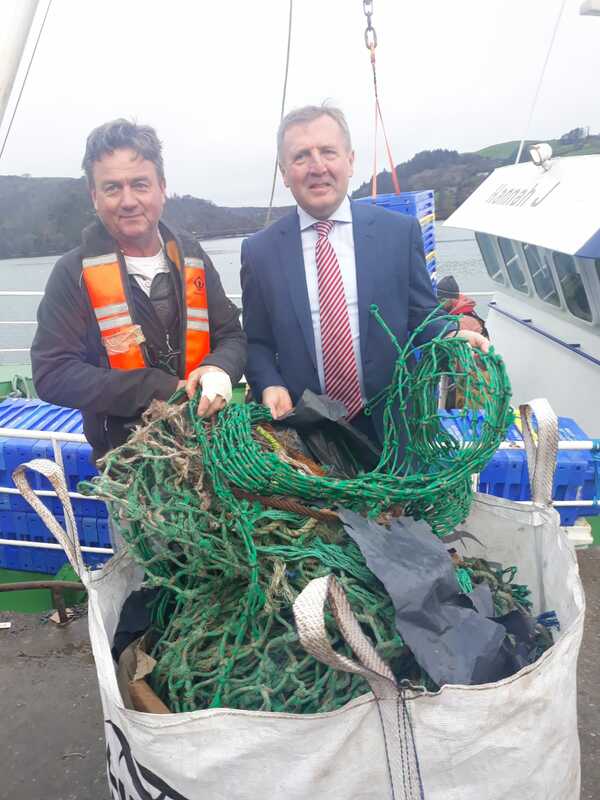 Building on the very successful Fishing for Litter campaign the Minister has challenged BIM to work with the fishing industry to ensure participation of 100% of Irish trawlers in the Clean Oceans Initiative by the end of 2019. BIM will report to him quarterly on the progress being made to meet that target. Fishermen have been living in harmony with the marine environment since the beginning of time, they share Minister Creed’s concerns and they have a key role to play in recovering discarded plastics from the oceans. Our fishing vessels are towing nets through the waters around our coast on a daily basis and often find debris, including waste plastics, when the nets are hauled. Minister Creed wants to facilitate our fishermen to bring this waste home from their fishing trip and he is encouraging our fishermen to recover as much plastic as possible from the seas around Ireland. He has made funding available under Ireland’s European Maritime and Fisheries Fund (EMFF) to support the new “Clean Oceans Initiative” to provide on-board storage facilities and on-shore infrastructure for environmentally friendly disposal of all plastics, waste, ghost fishing gear, etc. recovered at sea. The on-shore infrastructure will also be available to fishermen and aquaculture operators to dispose of unwanted fishing gear and other items with a plastics content. Contamination in the marine environment is not a new phenomenon and up to 80% of marine debris is made up of plastics. Total World production of plastics reached 335 million metric tons in 2016. Plastics do not biodegrade, they photo-degrade, breaking up from recognisable items of all sizes and shapes into tiny particulates. The risks posed to marine wildlife by waste plastics has motivated research to assess the extent of the problem and this is welcomed but we cannot afford to delay remedial actions so the Minister for Agriculture, Food and the Marine, Micheal Creed T.D. has decided to act now and promote all possible measures to prevent plastics from entering our marine environment and to remove as much plastics from the marine environment as possible.